An online master's degree in social work may be a great option for people who are committed to social justice, family welfare and caring for others. According to the Bureau of Labor Statistics, the job outlook from 2014-2024 is projected to increase 12 percent, about double the national average. The social work field can include careers like school social workers, substance abuse counselors, professors and policy makers. Find programs, discover what a typical timeline for an online master's degree in social work looks like and learn how a master's degree in social work can help professionals advance their careers and expand their ability to impact others. The flexibility of online programs offers prospective master’s in social work students the ability to continue to work in the field and maintain family commitments while obtaining an advanced degree. Because a prolific number of online programs exist, students may be overwhelmed when looking for an online master’s in social work program. Take a look at the rankings list below to help aid your decision-making. The list is based on a number of criteria, including public and not-for-profit status, graduate tuition and fees, student support services, job placement rates and peer-based value. Students can pursue a master of social work at Western New Mexico University both on campus or online. The program is open to graduate students even if they haven't already earned a BSW. The professors who instruct students are licensed professional social workers. The program, which is accredited by the Council on Social Work Education, focuses on the governing principles of social work, including human worth, compassion, service and social justice. Upon graduating, students will be prepared for work in a variety of fields and industries, including corrections, mental health clinics, schools, hospitals, nonprofit organizations, drug-treatment facilities and outpatient clinics. The master of science in social administration at Case Western Reserve University is offered to graduate students completely online. The degree is equivalent to an MSW, and is recognized by licensing boards, employers, schools and the Council on Social Work Education. The interdisciplinary program incorporates policy, practice, theory, research and advocacy. The program, which is offered through the Jack, Joseph and Morton Mandel School of Applied Social Sciences, is fully accredited by the Council on Social Work Education (CSWE). Students can choose from two distinct concentrations: direct practice and community practice for social change. Program outcomes in the University of Southern California's Master of Social Work program is to prepare adults for clinical social work. As they work their way through the studies, students have access to instructional support in the form of academic counselors, writing tutors and mentors. Online and in-person instruction delivery options are available. Study areas in the program are geared toward healthy aging, youth and families, business innovation and organizations and community. Class sizes are small. After enrolling in the program, adults can expect to learn in a seminar based environment. Graduate students pursuing a master of social work degree can choose to study full time or part time with no required campus visits. The program, which culminates in the same degree as its on-campus counterpart, prepares students to address and mitigate the effects of violence, exploitation, poverty, addiction, social inequity and social injustice as they relate to vulnerable populations. There are two tracks, one of which is designed for students who have already earned a BSW, and one that requires no experience or educational background in social work. Since classes are asynchronous, students are not required to log in at any particular time or on any set schedule. The online MSW degree has a special focus on advanced clinical practice. The program, which is accredited by the Commission on Accreditation of the Council on Social Work Education, is also available in an accelerated format. Advanced courses explore clinical practice with families and couples, especially as it applies to ethnicity, gender, multiculturalism, the elderly, oppressed groups, and military service members and their families. Students will have to meet once a week for evening webcam classes, and will have to be present for one weekend seminar on campus. The two-year, 63-credit program is designed for students who earned a bachelor's degree in social work within the last five years. Students who graduate with a master's degree in social work will be prepared to enter the field of clinical social work. Students may apply to the program, which is accredited by the Council on Social Work Education, whether or not they have a bachelor's degree in social work. Coursework is centered around the clinical curriculum, which incorporates ecological and empowerment strategies. Since so many at-risk people require both social and legal help, Washburn University offers a dual degree that culminates in both a master of social work degree and a juris doctorate degree. Students who graduate with a master of social work degree through the Myron B. Thompson School of Social Work at the University of Hawaii at Manoa will be prepared to work with both families and individuals, as well as communities, groups and organizations. Students will be able to choose between four fields of service, including health, gerontology, children and families, and behavioral mental health. The program acclimates students with the 10 areas of expertise listed as critical by the Council on Social Work Education. Advisors will help students choose the right classes and help them fulfil their graduation requirements. Online students may pursue a master of social work degree through the Worden School of Social Service. Active since 1942, the the Worden School was the first in the state of Texas dedicated solely to social work. The first track, which takes two years to complete, is designed for students who have already achieved a bachelor's degree in social work. The second track, which takes just over three years to complete, is intended for students who have an undergraduate degree in something other than social work. Graduates will be able to pursue leadership roles in social service agencies, as well as governmental agencies. Students who pursue a master of social work online receive the exact same education as students who attend the three campus locations. The program offers concentrations in research, leadership, clinical and macro practice. Students will have opportunities to apply their knowledge in a real-world setting through supervised field placements. Current social workers can pursue specialized study plans, and transfer students and students who already have a bachelor's in social work can choose an accelerated degree path. There are joint degree programs available in several specialties, including divinity, public health, law and psychotherapy. Distance learners can complete the program primarily online, but once admitted, they must continue the program through the online format unless they receive permission to switch. The first part of the program, which consists of 60 semester hours for everyone except for advanced-standing students, is professional foundation content. Next, they enroll in advanced courses, including elective and concentration courses. Although most full-time students complete the program in four years, students can also pursue the program on a part-time basis. The program includes education placements across the state, and a pre-orientation is designed specifically for distance learners. In addition to the rankings list, prospective students can utilize the search tool below to help narrow down master's in social work programs. Investigate potential schools by searching through the following filters: state, degree level, subject, accreditation, cost, student population and public or private school type. 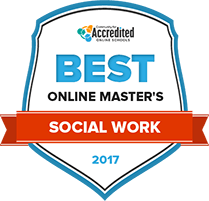 Applicants for online master's programs in social work should typically have a bachelor's degree from an accredited institution. In some cases, master's programs will accelerate the curriculum for bachelor's degree holders if they graduated in the field of social work with a high enough GPA. By itself, an online master's degree in the field may take 18 months to three years to complete. All accredited master's programs, online and traditional, will likely have a mandatory clinical practicum or fieldwork to complete. Online master’s programs in social work may take less time than traditional, on-campus programs. Online programs, however, will likely have the same coursework and degree outcome. Because the social work field has varying concentrations, students should have an idea of their specific preferences and interests when applying. Applicants who have a bachelor’s degree in social work typically already have background in social work history, policy and general theory, and if they’ve been able to maintain a 3.0 GPA or higher, the time to complete a master’s program may be greatly reduced. Most programs accept test scores for the GRE or MAT up to five years after completion of the exams. Sometimes, programs only accept one and not both, so students should be sure to take the test requested by their desired program. Applicants should consider asking their current supervisors, professors or community leaders for a reference. References are generally required for online master’s in social work programs, and they can offer an inside look into an applicant’s character, personality and work ethic. Applicants should also take great care in preparing a résumé that highlights social work qualities. Admissions officers typically want to know about an applicant’s work experience, current skill set and passion for the field. It can be difficult to get an idea of a person’s personality or suitability from just an application alone. For online master’s in social work programs that request an essay or a personal statement, students should seize the opportunity to describe who they are, what about a master’s in social work is interesting to them and how they plan to contribute to their community and to the field upon completion. Most online master’s programs in social work will require transcripts from a previous institution. Students should review their transcripts for errors and should pay close attention to their GPA. Accelerated online master’s programs are often offered to students who have a bachelor’s in social work; however, they often require the student to have completed the degree with a 3.0 GPA or higher. Some programs may accept students who do not have great test scores or GPAs. Online master’s in social work programs typically take a personal approach to admissions and consider life experience as much as numbers on paper. If a candidate falls into this category, it is possible an admissions officer will request on online or in-person interview. Candidates should let their passion shine through, be genuine and express their excitement at the possibility of entering into the field. Online master’s in social work programs can be expensive. Students should explore all available financial aid possibilities, including those inside and outside their specific program. Individual programs and departments may have scholarship applications, and some accept aid programs like the Free Application for Federal Student Aid (FAFSA) or federal grants. Once a student is accepted into an online master’s degree program in social work, there are a few milestones and objectives that one typically reaches in their first year of school. Students should take advantage of networking opportunities that schools offer. Building a network is a critical part of taking a professional role in social work; students will find jobs, internships and lifelong colleagues from these first connections. Specific master’s degree in social work programs that students choose will likely already have a concentration. For instance, students might apply to a clinical track or a family welfare track. But after completing the basic level of courses, students will often specialize even further within those concentrations. It will be helpful for applicants to have an idea of these specific areas within their program of study. Future employers in the social work field often consider volunteer experience among applicants. Students should search for different opportunities that may be available to them in their community, and often times, volunteer opportunities are posted or available within the social work department. Typically, a student will complete a master’s in social work program after the second year. The final year in the program will typically be focused on finishing fieldwork hours and specialized coursework. Many programs may require students to fulfill a fieldwork or practicum program. Hours may be completed in fields like hospitals, clinics, offices or schools. Hour requirements can be as high as 1,200, so students should be prepared to make this part of the program a big priority. Students typically will need to register for and complete advanced electives within the degree program’s concentration. Some programs require students to work on-site for a part of the degree program, even though the majority of course and fieldwork may be completed off campus. Students should try to plan work and family life around this time in order to take full opportunity of it. The chances to meet professors face-to-face, to interact with fellow students and to make real-life connections will often times help participants expand their network. In addition to the basic graduation standards, graduates of an online master’s program in social work usually have a few more requirements to fulfill before they can start practicing. States may have differing licensure requirements, so graduates should be aware of specifics. In many areas, recent graduates may be able to work under supervision before receiving any higher licensing. In most states, professionals are often required to pass the master’s exam at the onset of practicing and before completion of supervised work. Some states may require social workers to pass an additional clinical examination at the completion of their supervision requirements. Graduates should be familiar with the requirements of states in which they may eventually work. Professional fitness is usually determined to get an idea of a social worker’s mental and emotional ability to work within the field. Regulations may vary among different states. Some states require an interview, background check and fingerprints, while others only require one or two of those items. Graduates of a master's in social work program typically have a diverse field from which to choose a career. Students who enjoy the classroom and research may follow a path to teaching social work. Those who enjoy working with children may want to work in schools, while others may choose to help people overcome addiction. Below are a few potential career options and their statistics. School and family social workers typically work to provide social services and help to ensure high social and emotional functioning of children and their families. A primary goal of professionals in this field is to help children function at a high level at school and in academics. Professionals may deal with children in abusive settings, may arrange adoptions and may find foster homes. In schools, they are often helping teenagers who face issues like drugs and alcohol, pregnancy and truancy. Professionals in this niche of the field are usually tasked with treating people with mental, emotional and substance abuse problems. This includes alcohol, tobacco and illegal substances. Social workers in this area will likely use tools like group therapy, intervention, prevention and education as means to help their patients. Social workers may opt to teach students who are heading into the field. Instructors will often work at the post-secondary level in the university or college environment. Teachers are usually responsible for passing on information for the next wave of professionals as well as continuing research to further develop the field. Courses students take during an online master’s in social work program will often differ depending on the concentration. However, there are a few principles and theories that are typically common to all degree programs. Students are usually introduced to the history of the field and the profession, theory of practice, and professional values and ethics. Other topics may include current issues facing the field and requirements and challenges that practicing social workers face. Social workers are often required to communicate with others. In their master’s courses, students typically learn to engage with patients, listen actively and interview constructively. They are usually expected to understand how to engage with people while maintaining boundaries and a professional demeanor. Students typically explore the role of social workers in development and implementation of social welfare policies. Other topics may include history of social welfare and programs and policies that address poverty, healthcare and child welfare. Students typically gain an understanding of how to best help their patients. To do this well, they usually learn how patients view and represent themselves and how race, gender, socioeconomic status and other factors influence that representation. With this knowledge, students can design interventions, therapies and solutions for their patients. Masters students of social work can utilize additional resources that will help during their time as students and as they transition into the professional arena. Many member-based organizations may offer internship and volunteer opportunities, financial aid and professional development. Some resources often help students determine insurance needs and give policy updates, and many offer discounts for educational materials and national conferences. The organization is membership-based and offers regional and national conferences, outreach to new professionals and discounts on industry books and journals. This association works to provide services, products, support and a national identity for professionals in the field of clinical social work. This is a membership-based organization that is dedicated to protecting the interests of licensed professionals. It provides advocacy, representation and free consultative services for legal questions, and discounted comprehensive liability insurance. This non-profit organization offers professional education to its members and is major accrediting agency for social work education. The largest member-based organization, with 132,000 members in the field, this association focuses on professional development, policy and ethics and has a student center that is committed to financial aid, internships and education. This state-by-state guide updates students on licensure requirements for their area as well as provides information about master's degrees in social work and ways to further careers after graduation.